Explore Koerner’s fascinating life in the themes developed below through his own words shared in Memoirs of Gustave Koerner 1809–1896 and translated works, research commissioned by the Koerner Committee, original records at the county, state, federal, and international level, and articles and books published by others. Koerner’s Youth: Parental and community influence, Education in Heidelberg, Revolution! ] Emigration in 1833 See Koerner’s entry in the “Black Book,” picture him in disguise as he flees his beloved fatherland for the Utopia known as Missouri described by Gottfried Duden. ] Travel with Koerner in “The West” (now the mid-West). Still the political activist, Koerner attains his American Law degree in Kentucky, settles in as Attorney in Belleville, Illinois, becomes Illinois Supreme Court Judge, and Illinois’ Lt. Governor 1852–1856 Koerner’s Connection with Lincoln, Political Involvement, and anti-slavery beliefs are explored – Koerner became a close Lincoln confidant, joined Lincoln, Horace Greeley and others who, fired by the passions of the times, came together to create the Republican Party in 1856. Democratic Party member until 1854, Koerner was president of the State Convention securing Lincoln’s nomination to the U.S. Senate and helped write the 1860 Republican Party platform. 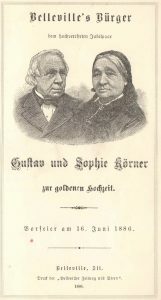 Civil War – Koerner was an ardent anti-slavery proponent and, as a German emigre, played a key role in allying western America’s German population with the Union cause. Read about these efforts and “Koerner’s Regiment” – the 43rd Illinois and more. 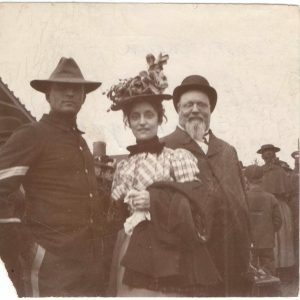 Minister to Spain in 1862, technically titled Envoy Extraordinary and Minister Plenipotenciary, Koerner’s experiences come to light once again in his Letter to Family from Madrid (translated), and Despatches from Spain. ] Family – 50th Wedding Anniversary, wife, children and descendants. In 1857 Koerner found himself involved in a controversy after he performed a humanitarian act. Jackson Redmond, a free black man, was found guilty April 7 of violating an 1853 Illinois law to Prevent the Immigration of Negroes and Mulattoes which required a $50 fine and court costs upon conviction. If the defendant could not pay the fine an auction would be held and his services sold to the highest bidder who paid the fine. Koerner came upon the scene as he returned from attending court outside the county. Koerner proclaimed no one would be sold in Belleville if he could help it and he paid the fine and court costs of $62. 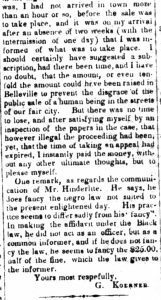 Constable W. H. Henderlite, who arrested Redmond, claimed Koerner did not personally pay the fine, but that the fine was paid by a group of anti slavery supporters who took up a collection to free Redmond. Koerner wrote a letter to the Belleville Tribune newspaper on May 8 refuting Henderlite’s contention. 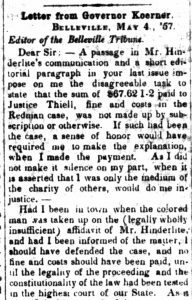 Later, Koerner’s political opponents would claim he purchased a slave, a charge meant to sully his anti slavery record. Charles Dickens visited Belleville in 1842. Koerner spent some time with Dickens when they had “chicken and fixins” at the Mansion House hotel before Dickens traveled to Lebanon to view Looking Glass prairie. Dickens book, “Notes on Travels in America,” cast a negative view of Belleville and its people and devoted a chapter to condemning slavery. Lt. Gov. William Kinney, a proponent of slavery, wrote a response to Dickens. It dealt more with protecting slavery than any other single subject. His writing can be found at this link. The following description of Gustave Koerner is in the introduction to Volume One of the Memoirs and was written by his son in law, Roderick Rombauer. It also can be found in the 1904 Journal of the Illinois State Historical Society, pages 286-307. 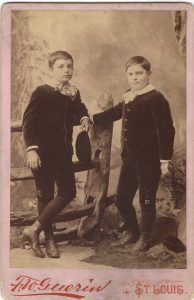 The personal memoires of Gustavus Koerner were not written for publication. Had such been the design, many details relating to his domestic and social life had probably been omitted. During the closing years of a long and eventful life, his children urged the octogenarian to write the history of his life, realizing, as he himself fully realized, that the most valuable heritage which one can leave to one’s descendants is one’s own history, provided it is the history of an active, unselfish, and useful life. It is a source of regret that so few of the autobiographies of our prominent men deal with the details of their domestic and social life. It is probably due to the fact that the writers regard it as a sanctuary to be wirhdrawn from the public gaze, the key to which, when they are gone, is forever lost. Yet how much more thorough would be our understanding of their lives and actions, were we permitted to lift the curtain, and get the occasional glimpses of what lies hidden by its folds! Far West; the struggle of the young lawyer to make a precarious living at a time when judges and preachers rode the circuit, must be of interest to the careful student of the history and growth of a young nation. In common with others of his contemporaries who attained eminence, Koerner had to overcome the disadvantages of a foreign birth and of very limited means. An indomitable energy, however, and a sincere desire to be of use to his fellowmen, enabled him to overcome these obstacles, until both in the ranks of the legal profession, and among the statesmen of the land, he gained an eminence attained by few. Comparing him with the foremost of his contemporaries of German lineage, it may justly be said, that while he lacked the forensic eloquence of Carl Shurz, and while the erudition of John B. Stallo may have been greater, he surpassed both in a thorough understanding of constitutional limitations as applied to American institutions, and was a far better judge of the needs of the nation in measures and men than either of them. Thus, while in the National Convention of 1860, Shurz was one of the leading advocates of the nomination of William H. Seward for the Presidency, Koerner was equally emphatic as a supporter of Abraham Lincoln. History has long since rendered her verdict as to which of these two candidates was apt to be the fittest leader of the nation in the hour of its greatest need. It is a remarkable coincidence that while Koerner was thus active in giving to the people a President, who, with boundless love and toil, reunited the fragments of a nation, and who, of all his predecessors, left the sweetest memory behind him, he also materially aided in starting the nation’s greatest military leader, U. S. Grant, on his phenomenal career. In religious belief Koerner was an agnostic. Growing up in the atmosphere of German universities, the hot-bed of agnosticism, it could hardly be otherwise. But he was equally free from the intolerance of the zealot and that of the skeptic. While rejecting the mythology of the Christian religion, he was a firm believer in its ethics, as being superior to any which has heretofore actuated mankind. Freedom of conscience meant for him what it ought to mean, the right of every human being to formulate his own religious belief. He fully realized the truism, that it is not what one believes, but what ones does, actuated by such belief, that determines the merit of his faith. His letter to Robert Ingersoll, contained in these memoires, is a lasting monument to his just conception of the freedom of conscience. In the small western community in which he lived, he was the absolute arbiter of men’s opinions on public questions, because his integrity and his absolute freedom from partisan bias were such, that on all public questions his fellow townsmen were willing to conform their views to his without question. His domestic life, like that of most of our public men of note, was exemplary. Although he felt keenly the early loss of all his sons but one, he bore the affliction with the fortitude of the philosopher. But the loss in later years of his wife and life-long companion, inflicted a blow from which he never recovered. The Koerner House Restoration Committee, working with a team of consultants, has prepared a Historic Structure Report. Selective demolition of the structure’s modern components commenced in May 2005. Once completed, the home will be reopened as a museum, where Koerner’s life and political career will be interpreted.